Friday 15th of August, 2014 marked the 69th Anniversary of Victory in the Pacific Day (VP Day) celebrations. This date commemorates Japan’s acceptance of the Allied demand for unconditional surrender on the 14h of August 1945. For Australians, it meant that the Second World War was finally over. On August 15th Prime Minister J. B. Chifley announced the end of the war against Japan and the government gazetted the day as a public holiday. RAInf, whom we thank for allowing us to reproduce this in full here. 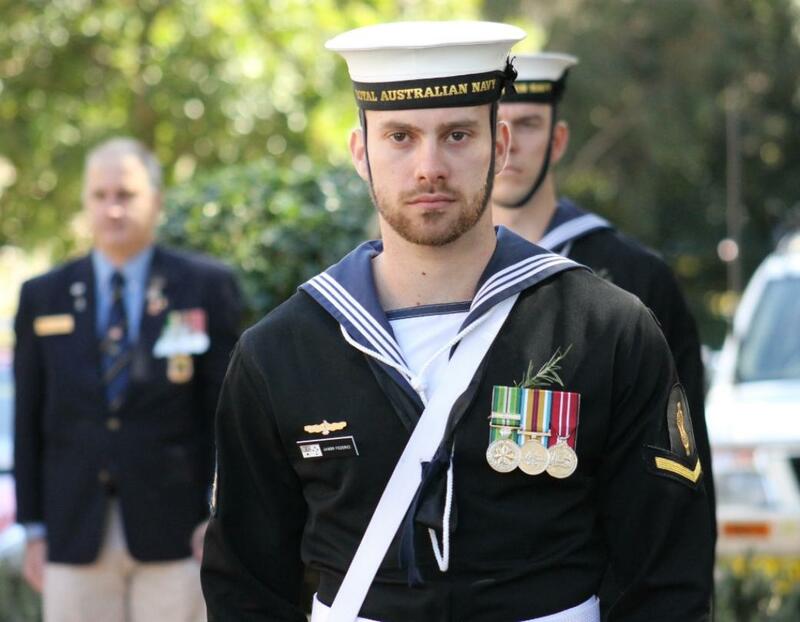 The Catafalque Party and Honour Guard was formed from NUSHIP CANBERRA (CO Captain Jonathon Sadleir RAN) - (Catafalque Party Commander), the Colour Party was formed by Avalon Beach RSL Sub Branch members Andrew MacGregor, Robert Murray and Peter Kelly while Mark Bradbury had charge of the main flag post. The Prayer for the Fallen was read this year by the Hon. Rob Stokes MP for Pittwater and NSW Minister for Environment and Heritage, the Central Coast and Asst. Minister for Planning, while the Prayer for the Services was read by The Hon. Bronwyn Bishop MP, Member for Mackellar and Speaker of the House of Representatives. The hymns, The King of Love and Abide With Me were led by the Avalon Voices, as was the National Anthem to close this year’s VP Day Service. Wreath laying: Robert Dodds and Bob Lacey (Vice-Presients of Avalon Beach RSL Sub Branch) Bob White (Avalon Beach RSL Club), Commanding Officer HMAS Penguin, Commander Paul Gall, Hon Bronwyn Bishop and Hon. Rob Stokes, LTCOL Matthew P. Stevens, CSC, Pittwater Councillor Bob Grace and Mayor of Pittwater, Her Worship, Councillor Jacqueline Townsend, those attending laying sprigs of rosemary. LTCOL Matt Stevens is the proverbial local boy makes good. Educated at Pittwater House Grammar School at Collaroy, he joined the Army in 1986 as an apprentice, graduated as an Automotive Engineer and was subsequently the Army Apprentice of the Year, transferring to the Royal Australian Infantry Corps after completing the SAS Regiment selection course. During the next 12 years in SAS he saw service in Bougainville and East Timor and as the lead Counter Terrorist Team commander for the Sydney Olympics before being commissioned in 2002. He served as a Platoon Commander at 4RAR Commando during the raising of Tactical Assault Group East and for his outstanding achievement in this counter terrorist capability was awarded the Conspicuous Cross, then serving as a Commando Company Operations Officer. He returned to SAS in 2004 with two deployments to Iraq, receiving a CDF Commendation for command and leadership. After staff postings and a deployment to Operation Slipper, he again returned to SAS in 2008 to command the 2"d SAS Squadron with deployments to Afghanistan for which he was awarded the Commendation for Distinguished Service for his distinguished command and leadership. LTCOL Stevens was then posted on exchange in the United States as the Chief of Exercise Plans in the Ops Division of HQ I Corps in Washington for which he was awarded the US Meritorious Service Medal. He returned to Australia in 2013 again to demanding staff postings and has been selected as the Commanding Officer Designate, 1st Commando Regiment, effective December 2014. LTCOL Stevens lives at Newport with his wife Natalie and two children. Ladies and Gentlemen, LTCOL Matthew Paul Stevens CSC. It’s a great honour to be here with you today as we reflect on the sacrifices and the marvellous achievements of the Australian people in their contribution to the Allies’ Victory in the Pacific during the Second World War. On August 15, 1945, Prime Minister Ben Chifley announced to the nation that Japan had unconditionally surrendered, and as a consequence, the Second World War was over. Australians joyously reacted to the surrender with celebrations breaking out all over the nation. For a jubilant Australia wildly celebrating, one thought was paramount - The war was over. But, in the immediate aftermath of these celebrations, Australians began to appreciate that, because of the six years of war, the world had changed. And, Australia too was forever changed by this most destructive of conflicts. We gather here this morning to commemorate the end of War in the Pacific 69 years ago. Of the many commemoratory events in the course of each year, including those marking the conclusion of past conflicts, this one is of particular significance. The Pacific War was the first and only time in our Nation’s short history where our territorial integrity was subject to threat, with acts of war carried out against our people on Australian soil. VP Day is an important occasion for all Australians. It holds particularly special meaning for those who endured the Second World War, especially for our veterans, and for those whose loved ones did not return, or who returned suffering grave physical and mental injury. Today, as we reflect on the service and sacrifice of our veterans, we should take a moment to consider what it was they fought for sixty-nine years ago. Whilst the early years of World War II in Europe and the Middle East brought little change to daily life for most Australian families, the bombing of Pearl Harbour in December 1941 signalled the start of Japan’s rapid advance through the Pacific. The day after crippling the US Navy’s Pacific Fleet at Pearl Harbour, Japan landed its first troops in Malaya. A powerful Japanese offensive ensued, and Australia hastily prepared for possible invasion. With the majority of our 2nd AIF, Naval and Air Forces already heavily committed in Europe, the Middle East and North Africa, Prime Minister John Curtin decided to withdraw most of them to meet the requirements of defending Australia. In January 1942, Japanese forces captured Rabaul, the capital of the Australian-controlled territory of New Guinea. Within weeks, Australian and Dutch forces had surrendered the island of Ambon. When Singapore fell on the 15th of February 1942, 15,000 men of Australia’s 8th Division were taken captive which was the start of over three long years in captivity. The loss of Singapore meant the “Malay Barrier” had been breached, and Australia was in potential danger. The war arrived on Australia’s shores on the morning of 19 February 1942 with a devastating air raid on Darwin. Nearly 260 Japanese fighters and bombers attacked the port. They targeted the shipping in the harbour twice during that day, killing 252 Allied service personnel and civilians. In succeeding months, air attacks were made on many towns in Western Australia, the Northern Territory, Queensland, and in the Torres Strait. In May 1942, three Japanese midget submarines attacked Sydney Harbour, followed by several minor attacks on Australia’s southern coastline by conventional Japanese submarines. In the following months, Japanese submarines sank six Allied merchant ships off the east coast of Australia. Several more merchant ships were hit in 1943, and in May that year, 268 perished when the Australian Hospital Ship ‘Centaur’ was sunk in Queensland waters. These attacks and the Japanese landings in Papua New Guinea in July led to most Australians feeling a great sense of peril. While debate today questions whether the Japanese had really developed a coherent strategy to invade Australia, it would have been extremely difficult at that time, not to imagine Australia being the next objective of the Japanese. The first six months of 1942 were indeed a grim time for Australians and its allies in the Pacific. But in September of that year, Australian forces achieved something that no other allied force had yet achieved. At Milne Bay, a combined force of Australian Army, Air Force and US forces defeated the Japanese for the first time. Victory here and a few weeks later their defeat along the Kokoda Track, marked a turning point, the seemingly “unstoppable” Japanese had been stopped. This was an important psychological victory. After the defeat of the Japanese at Kokoda and Milne Bay, Australian and American units between November 1942 and January 1943 fought the Japanese in northern Papua in a series of costly battles. By early 1943, Allied forces had halted Japanese offensives in the Solomon Islands and New Guinea. In 1945, Australian forces launched coordinated assaults against the Japanese in Borneo. These were the biggest, most complex and the final Australian campaigns of World War II. Preparations were also being made for what would have been an extraordinarily costly assault on the Japanese mainland. However, with the atomic bombing of Hiroshima and Nagasaki in August 1945, Japan finally realised the futility of continuing the war, and accepted unconditional surrender. On the home front, Australians wanted a return to normal life as soon as possible. Commonwealth wartime regulations were terminated. And there was gradual end to rationing and manpower restrictions. Women started returning to their homes, but many remained in the jobs which they had won grudgingly during the times of manpower shortages during the war. However, a priority for the government was the demobilisation of Australia’s largest ever military force. Almost one million Australian men and women enlisted during the Second World War. It remains the largest commitment of Australian soldiers, sailors and airmen in our history. During the early years of the war, over 22,000 Australian servicemen and almost forty nurses were captured by the Japanese. Although it is difficult for us to understand what these brave Australians endured, the fact that 1/3rd of our POWs perished in captivity is some indication of the appalling conditions they suffered. Most became victims of their captors’ indifference and brutality. For Australia, Victory in the Pacific ended 6 years of hardship, sacrifice and anguish. It heralded the start of what many people hoped would be a new era of peace. So in remembering the nearly one million Australian men and women who served, and the 40,000 who died fighting to protect the freedom we enjoy today, it is worth reflecting on the legacies of that great generation of Australians. In the post-war period, Australia emerged as a more confident nation, one more open to the world. The slogan “populate or perish” won widespread acceptance and prepared Australians for a massive immigration program that would double the population within a generation. The immigration program required a great expansion of employment and this was achieved by building on the industrial base created by the war. One of other the great legacies of the war, is the close relationship Australia forged with the United States. It is a relationship that endures to this day, and is central to the economic health and security of our nation. At the end of hostilities, Australia was also able to forge a new relationship with Japan. Their post-war democratization resulted in stronger economic ties with Australia, and today Japan rates among our closest trading and dialogue partners. Importantly though, we commemorate and treasure the spirit of service before self that these wonderful Australians showed. They demonstrated that true democratic freedom must be nurtured and protected; and when threatened, is worth fighting, and if necessary, dying for. This legacy is one that subsequent generations of Australians must continue to nurture and cherish, as we struggle against those who would challenge democracy and the individual freedoms that are so fundamental to our culture and society. The war in the Pacific tested the character and commitment of the Australian people. Whether they served in the sands of North Africa, the jungles of New Guinea, in the air over Europe, on the high seas, or in the factories and farms of the home front, we remember today a generation of magnificent Australians who fought to protect our way of life; our democracy, our culture, and our land. We appreciate that through their valour, our country emerged from the Second World War with a new sense of economic, political and social independence. They inspire us with their example and our nation rightly owes them its deepest and most sincere gratitude. The Hon. Bronwyn Bishop who is undoubtedly the greatest supporter and advocate of the ADF and our dependents in Parliament and always graces us with her presence. I don't know how you manage to attend all the local events. The Hon. Rob Stokes, our outstanding member for Pittwater, apologises for being unable to attend lunch but he has many portfolio duties and a parliamentary meeting this afternoon. Similarly, Mayor Jacqui Townsend apologises for not being able to stay for lunch. She is most ably represented by Pittwater North Ward Councillors Selena Griffith and Bob Grace. We value the close relationship the sub-Branch has with Pittwater Council, particularly in supporting Commemorative Ceremonies and the annual Tattoo. I would like to thank LTCOL Matt Stevens, a sub-Branch member, and Natalie his wife. Matt is always available to help with our schools' program. Thank you for the magnificent Commemoration address and all the best as CO of 1 Commando Regiment. Superintendent Dave Darcy the Commander of the Northern Beaches Local Area Command has had a sudden last minute higher priority and is represented by Inspector Jo Comber. Mr Bruce Crossie, Divisional Chairman Northern Beaches Legacy and Janet. Legacy plays such an important role in supporting Veterans' widows and dependents. Legacy Week is from 31st August to 5th September and the Avalon Club have committed to supporting Legacy. To our Navy guests, CMDR Paul and Meredith Gall, LCDR Wendy Duffy and Steve from HMAS PENGUIN and LCDR Chris Hunt and Sarah from HMAS KUTTABUL Thank you. Thanks too to the NUSHIP CANBERRA and particularly Sub Branch member Ian McGiffen for forming today’s Catafalque Party. As today is a school day, in the absence of the normal cadet Catafalque Party, they did a tremendous performance. Potential Army ADFA entrant Will Russell is present with his sub-Branch grandfather Anthony Russell. If Will is successful and then joins us, it will be our first Grandparent/Grandchild membership. We have a number of parents and children members. The potentially raucous table of ladies with Dean Guberina trying to take charge are all sub-Branch members' guests but to be encouraged to bring their husbands to future socials as Club Ltd or sub-Branch members. Future social events for 2014 are on the tables. The 2015 program will be approved at August’s GM. The great support today from NUSHIP CANBERRA reminds me of the new sailor joining his ship. The crusty old CPO wants him for a job and calls "You sailor; come here; what's your name?" "What sort of namby pamby Navy do you think this is where I'm going to call a junior sailor by his first name. What's your Name?" "Come here John, I've got a job for you!" Seriously, in acknowledging CANBERRA here today, we would welcome you and your shipmates as members. Avalon may be a distance from the city but you would be welcome at our social functions and to join us in our commitment to the community, particularly youth, cadets and schools. We have an active program to support serving men and women, veterans, widows and dependents. Our Memorial days, particularly ANZAC are the largest in NSW outside the CBD. If you are interested in joining, as you are currently serving, there is no annual fee for the first year but you have to join the RSL Club. Lynn Murphy, the sub-Branch Secretary, can help with applications. The sub-Branch interaction with schools continues to grow. We stress to students that the ADF is not interested in making war. It is to make peace and be a credible deterrent to protect Australia. That involvement is typified their participation in the Tattoo, ANZAC Day and by the record entries in the Northern Beaches and particularly Pittwater schools "Australia My Country" competition this year in which students submitted entries about what makes Australia their Country. Thank you Harvey Rose our coordinator who is about to join the panel to select the Northern Beaches winners to be awarded by Bronwyn later this year. On a somewhat sadder note, I would ask Mark Bradbury to stand. After 10 years service in the APS and 35 years combined service in PNF and Reserves, following his motorbike accident on the 25 Feb 2012, it has been determined that Mark is to be medically retired and that today, 15th of August , will be his last day in the Service. Mark, Thank you very much for your commitment and support. We wish you, Tanya and family all the best. So afterwards, downstairs, please thank Mark and buy him a drink as long as it is the new beer called "responsibly" so that he can say he was drinking responsibly. Please stand while vice President Bob Lacey proposes the loyal toast. Please remain standing for a musical rendition of Waltzing Matilda interspersed with the Last Post, graciously provided by the Vietnam Veterans Northern, to be followed by Vice President Robert Dodds proposing the toast to departed comrades. I would now ask sub-Branch member, the federal member for Mackellar and Speaker of the House of Representatives to give a short address and then the Grace. As I prepared to come to this Service this morning I reflected on how special this day is to me as my dad served in the islands. He didn’t tell me the stories of what happened but did tell my brother these stories as that stage I think it may not have been quite right to tell daughters, but you could tell sons. These stories related extraordinary hardships; the landing on Balikpapan was one example, and the areas where he served designing and building airstrips so that we could keep the Japanese at bay. I thought of his experiences when I accepted the invitation to walk the Kokoda Track for the opening of the memorial at Isurava. I became aware of the importance Isurava through Charlie Lynn who set out to make people understand how vital that battle was because the Battle of Milne Bay was the first victory we had and at Isurava was the first time we turned back the Japanese soldiers, even though this was a tactical retreat until their supplies ran out. What happened up there at that time was pretty horrible – there was cannibalism by Japanese soldiers when they began to starve after being left behind, you could almost still hear the screams of an Australian soldier in the jungle when he was captured and tortured. ..and our men had to hold back because if they’d gone in and done something about it the Japanese would have known that they outnumbered us 6 to 1 and could have gone on and taken Moresby. There are those who say that Australia was never going to be a target for the Japanese – I don’t believe that for a moment. We were bombed and these were the same planes that bombed Pearl Harbour. The sorties that were flown were close to 700. People died and it is only now that we commemorate the 19th of February 1942, the bombing of Darwin. But back up there on the track, that tactical battle that was fought, that tactical retreat, was something quite awesome. The men of the 39th Militia Battalion 'Maroubra Force', along with the Papuan Infantry Battalion, were all around 18 years old and from Melbourne, they were told they were going to Brisbane, and ended up on the Track. Then they got Ralph Honner, Lieutenant Colonel Hyacinth Ralph Honner DSO, MC - he did something quite different and didn’t follow what would normally have been done in sending them to the back of the pack, he rallied them and spoke to them, told them they could go forward. He maintained the 39th Battalion's cohesion and morale, and led them in a fighting withdrawal down the track, and they didn’t let him down. They were relieved by men who came in from the desert, still wearing their desert caps and uniforms in the jungle; the 2/14th Battalion. Soon after this the word came down the line ‘come back, we need you’ and all but three of them came back. Of those who couldn’t come back, one had lost an arm, the second an eye and the other was ill from fever. But they held the Japanese. The first serviceman to be awarded the VC in Australian territory, posthumously, was Bruce Steel Kingsbury, a member of the 2/14th Infantry Battalion during the Battle of Isurava, who held a machine gun that was so hot from repeated firing that the person who took it next burnt his hands. So Victory in the Pacific Day means a hell of a lot to me. In some ways I think if it weren’t for World War II I wouldn’t be here; my mother was an Opera Singer, my father an Engineer, they were going overseas in November of 1939; my mother to study in Europe, my father to join his father – but something else happened, and dad joined up. When he was posted north my mother said ‘I think I’d like to have a child’; and that was me. So I often say it took World War II and this 1942 when things started to get better and we began to become more optimistic that we could win, for me to come along. So Mr Chairman, I possibly have gone on a bit long, but today is a most important day. It marks something that is a part of my life that I will never forget. There is not one day that goes by when I do not remember the sacrifice of my dad, and his cohorts who served, that gave me the gift of freedom. I have a huge obligation to ensure that the generations that come after me have the benefit of that same gift. And that we never do forget, and that we’re always prepared to fight for it – it is what makes us Australian – it is what makes us the people we are. So thank you for letting me speak today – it is an important day for me. The Avalon Beach RSL Sub Branch thanks the VIPs, NUSHIP CANBERRA, all attendees, the Avalon Voices, and the Avalon Beach RSL Club and its staff for their help and financial contribution to this day. 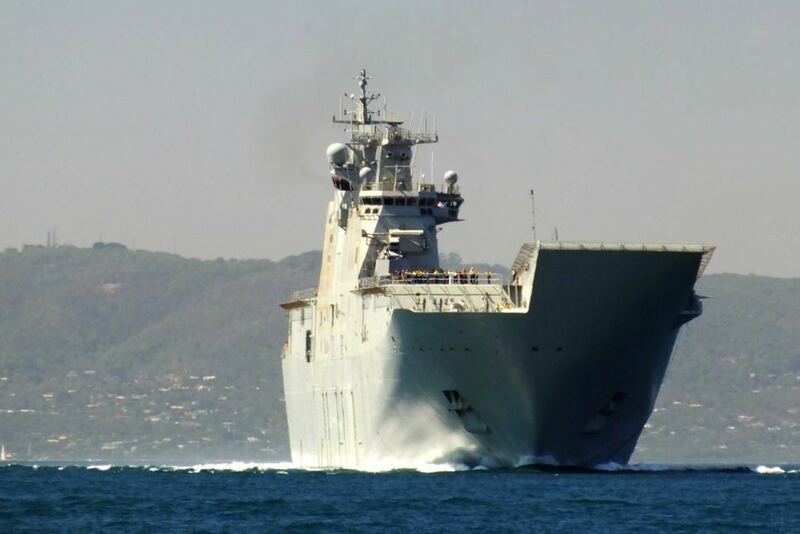 The first of two Canberra Class Amphibious Assault Ships to be completed, the 27,000 tonne HMAS Canberra will be the largest ship ever built for the Royal Australian Navy. Also known as a Landing Helicopter Dock or LHD, the ship will be able to land 2,000 armed personnel in helicopters and water craft, complete with vehicles, supplies and ammunition. She has been engaged in sea trails on Melbourne's Port Phillip bay earlier this week (See ABC report August 13th, 2014) Photo by Captain Andrew Mackinnon.